I would like to give a brief overview of my career to date. I moved to New York City from London in 1993. I studied with renowned alto saxophonist and educator, Dave Glasser. After four years playing around New York I decided to take formal music education and seek a degree in saxophone performance.. I began in the Jazz program at San Francisco State University, studying sax and piano with John Handy, Hafez Moderzedeh, Dee Spencer, Andrew Speight and Wayne Wallace. I was fortunate enough to take private instruction with Branford Marsallis. I played lead alto in the San Francisco State Big band at the state finals and had several gigs around the Bay area, as well as leading my own trio. At this time, I decided to further my playing by moving to Duquesne University in Pittsburgh. I took applied lessons with classical tenor master, James Houlik as well as sax quartet and jazz combo with Steve Pollock, Mike Tommaro and Dr. John Willson. I also studied piano and teaching methods. I graduated with a Bachelor of Music in saxophone performance. I had a small studio of students as well as my own quintet playing clubs and corporate functions. I had the opportunity to play in The Roger Humphries Big Band as well as festivals and the Pittsburgh Jazz Society. I played at The Manchester Craftsman’s Guild, Dowe’s on 9th, Pittsburgh Symphony Hall cafeteria and various corporate functions and events. I played several pit orchestras in productions including Damn Yankee’s and The Pittsburgh Opera’s production of The Three Penny Opera. I began the Bar Harbor Jazz Festival in 2004 and ran it for three years. I gained sponsorship, permits and performers, Kenny Werner, Dave Glasser Quartet, Laslo Gardoney to name a few. We provided master classes at the high school for local musicians. I also had a group of high school students that I worked with, eventually leading to paid gigs with me as band leader. I played with my own group, Four, opening for pianist Ronnie Mathews and sax player, Dave Glasser at The Criterion Theater. I also performed at The Bangor Blues festival and was side man with Kansas sax legend Harvey Kaiser on his visit to Maine. I have since settled in South Florida. 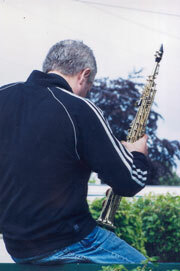 I have been teaching for over ten years and currently teach sax, flute, clarinet, piano and theory. I have a studio at Chafin Music as well as my home. I teach woodwinds at Rolling Green Elementary and band at West Palm Beach Junior Academy. My Jazz quartet “Remedy” perform around Palm Beach and you can find me weekly at The Blue Anchor Pub, Over the Bridge Cafe and The Colony Hotel in Delray Beach. I have played in a variety of musical styles in the area. Currently I perform with numerous local bands as well as jazz gigs at The Delray Beach Club, Palm Beach Polo Club, corporate and wedding functions around South Florida. I have just began working on a new project with singer Lucie Pierro. The band is called Public House and you can find us on Facebook. I am available for private or group lessons and performance from solo to large group ensemble.